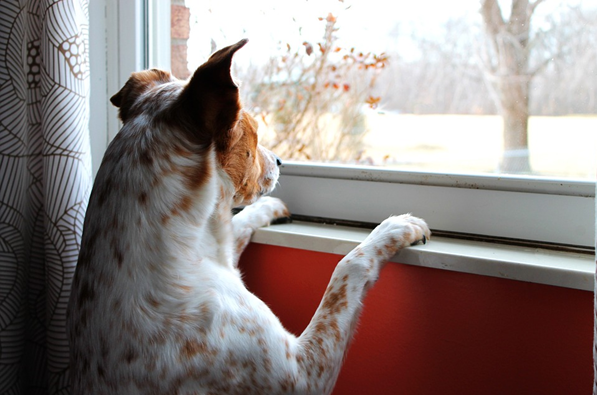 Separation anxiety is a common issue with many dogs and one that owners struggle how to resolve. First, let’s find out what causes this behaviour and look at some tips to help dogs which suffer from this serious issue. Some breeds are more prone to separation anxiety than others. Labradors and Collies, for example, were bred to work by their master’s side all day. They do not do well when left alone. Neither do the so-called “velcro dogs” like Cavalier King Charles Spaniels, Chihuahuas and the Bichon Frise who want to constantly be by their owner’s side. Rescue dogs can also understandably be prone to this disorder becoming fearful that you will not be coming back for them. It is a good idea to discuss this with your local dog rescue centre. If you are considering rehoming a dog and intend to be at work so they can match you with the right dog. The good news is; there are things we as owners can do to help our canine companions. Most cases of separation anxiety can be reduced by following these simple tips. It’s a good idea to start getting your dog used to being left alone at an early age; even if you are at home much of the time. That way they will be used to being alone when the situation arises. The methods used can work for older dogs too, although it might take a bit more time and patience. Begin by getting your dog used to out-of-sight stays inside the home; for example, leave him outside the bathroom and gradually increase the time you are out of sight. Once he is relaxed and happy with you doing this you can progress to leaving him for a few minutes while you go outside. As you increase the time, start giving him a Kong or chew toy so he associates this with a safe separation. Do a few short sessions like this every day gradually staying away for up to an hour. Initially stay nearby. If you hear your dog barking or howling go back to the beginning. Each time he completes the separation without issue praise him or give a reward. No matter what the breed taking your pooch for a walk before you leave. This will lessen the chance of destructive behaviour while you are gone. A dog that has received the mental and physical stimulation during a brisk stroll will be more likely to be in resting mode while you are away. Take a ball or a Frisbee, use one of the specially designed dog back packs. Do some scent work all these things will tire your four-legged friend out. Then he will hopefully be much less likely to destroy the sofa or urinate in the house. Boredom is often confused with separation anxiety. A dog left alone with nothing to occupy him for hours on end will look for alternative forms of entertainment. This may result in emptying the rubbish bin or eating your favourite pair of trainers. So whether your dog suffers from separation anxiety or not it is essential to keep them occupied while you are out of the house. There are a number of great food orientated puzzle toys available which offer mental stimulation. A filled Kong or juicy marrow bone will also do the trick. 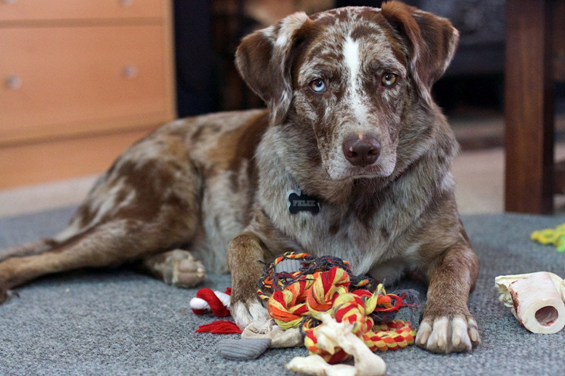 Chew toys encourage licking and obviously chewing, which has a calming effect on canines. It is important to take these away when you return. This way your dog learns that they are special treats and looks forward to them when you are away. Always take any edible treats out of your dog’s daily food allowance to prevent obesity which can lead to serious health problems. How often do you notice your dog reacting when you put on your coat or pick up your car keys? Often without us knowing we are sending signals to our dogs which can lead to stress and unintendedly our habits can be exacerbating theirs. If your dog starts to panic when you pick up your keys try picking them up and then sitting down to watch TV, put on a jacket while doing the vacuuming, leaving via a different door. This will make them less likely to associate stress inducing actions with your leaving the house. Also, avoid long drawn out emotional goodbyes, our dogs pick up on our behaviour so keep calm and don’t make a big deal out of leaving it will only make matters worse. This is a great way to make a dog feel he is not alone in the house and has 2 benefits; Firstly the sound of a human voice will have a calming effect and secondly will drown out any outside noises which your four-legged friend might find fearful. You could even try making a recording of your own voice singing or reading aloud and play it in another room so Fido thinks you are just busy in there instead of abandoning him. Be aware this strategy doesn’t work for all dogs, especially those who suffer from extreme separation anxiety, the extra noise may even distress them further and it will not prevent a dog from becoming bored and chewing the cushions, but combined with the other methods it may help. If your canine companion has managed to harm himself due to extreme separation anxiety and yes there have been cases of dogs clawing through solid doors, getting caught up in blinds, even smashing windows! In these situations your vet may be able to prescribe medication to keep your dog calm. While this does not address the underlying issue, or solve the problem it may be necessary in some cases. There are also several calming products available over the counter, sprays, plug-ins, wipes, and collars produce pheromones which reduce the stress levels in anxious dogs. You could also try a Thunder-shirt which stretches around the dog applying light pressure and can be useful for calming dogs who suffer mild separation anxiety. Of course, none of us like to see our beloved pet suffering and it might be easier all round to arrange alternative care while we are out. Pet sitters and doggy day-care centres are readily available in most areas these days. Although this solution is not affordable for many, it is worth it to know our best friends are cared for in our absence. Always do your research before choosing someone to care for your pet and be aware that while it is not often some dogs do not do well in day care situations being surrounded by other dogs and strangers is sometimes more stressful than being home alone. Crate trained dogs will probably associate their crates with security and safety. So it is much better to place him there when you leave the house. However, don’t be fooled into thinking that a crate is the answer. If your previously un-crated dog suffers from separation anxiety, crating is unlikely to be a solution. If you are planning to crate your dog regularly, you should only leave him in a crate for a maximum of 3 maybe 4 hours. An anxious dog in a crate may injure himself trying to escape. A much better idea in this situation is to confine your dog to one room. For example, the kitchen and use a safety gate. Give him something with your scent on and something to occupy his mind and he will likely feel much safer than having a large house all to himself. It also may save you some money on damages. Hopefully, these tips will have helped manage your dog’s separation anxiety. 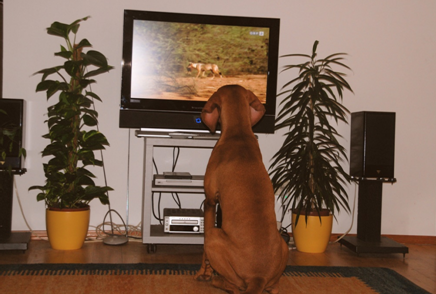 More serious cases may require the help of a dog behaviourist. It is up to us to be the owner our pets deserve. Often it’s our habits that cause stress in our dogs. If we learn how to project a calm and relaxed attitude while teaching our canine friends to accept a variety of situations; train them from an early age they will lead healthy happy lives and grow into well-adjusted adults. Dogs are social animals and don’t do well if left for long periods. Something to consider before bringing one into your life.